As vice president of education policy at the U.S. Chamber of Commerce, Cheryl Oldham (J.D. 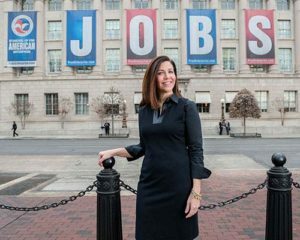 ’93) influences U.S. education policy on behalf of the nation’s business interests from her office in Washington, D.C.
She is also vice president of education and workforce programs at the U.S. Chamber of Commerce Foundation, its nonprofit arm. There, she focuses on engaging the business community, championing business reform, promoting policies, and developing programs that will lead to an educated and skilled workforce. She is passionate about the education of our nation’s children, and she sees her role as critical to their cause. Oldham is proud of the education policy improvements she’s seen in her career, particularly those related to higher ed. While working at the Department of Education with the Commission on the Future of Higher Education, Oldham said they were successful in changing the conversation to one centered on outcomes and accountability. But she realizes the future will bring more challenges as the cost of earning a degree rises. She predicts this will require colleges and universities to have an even greater focus on accountability. “We shouldn’t be afraid of data, and we should be willing and able to stand by our outcomes,” Oldham said.